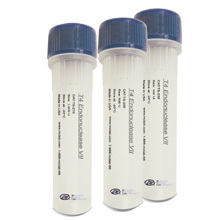 MCLAB's premixed solution allows the user to perform fast staining on SDS-PAGE gels for protein analysis. This staining solution is nonhazardous and does not require the use of methanol and acetic acid for destaining. 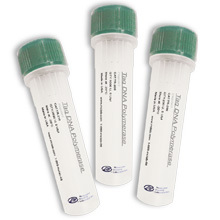 Protein bands become visible within minutes and the whole process takes 30 minutes. 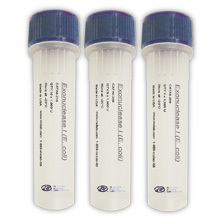 MCLAB's premixed proprietary coomassie blue solution allows the user to perform fast staining on SDS-PAGE gels for protein analysis. This staining solution is non-hazardous and does not require the use of methanol and acetic acid for destaining. Protein bands become visible within minutes and the whole process takes approximately 30 minutes. - Discard the hot water and repeat until dye front becomes faded or disappears. - Remove water and add in 50 mL of Quik-Stain (or enough to completely cover the gel). - Microwave for 1 minute and repeat until protein bands become visible. - Discard the staining solution and replace with water for destaining. - Place a kimwipe on top of gel and microwave for 3 minutes. - Replace with new water and repeat process until desired destaining results has been met.